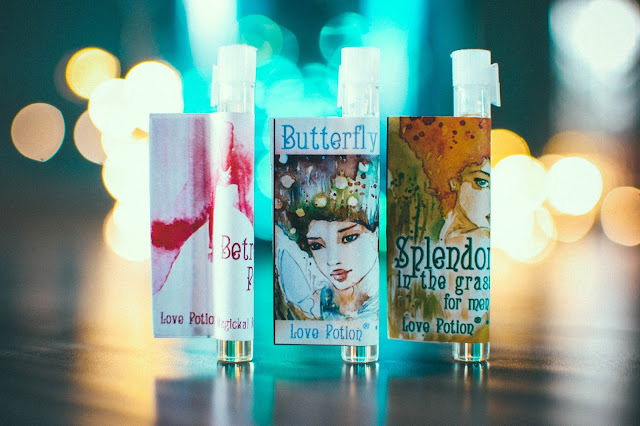 These scents were scent free by Love Potion Perfumes. It is my pleasure to review them. 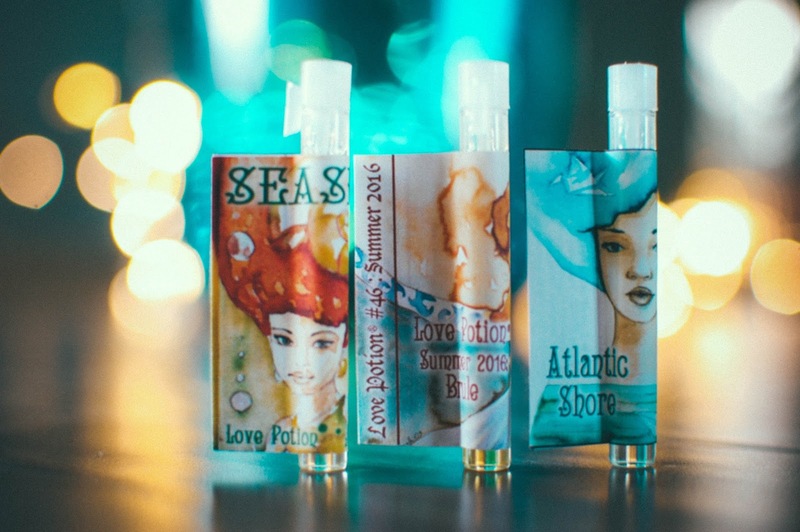 I have been falling head over fins for these 2016 Summer scents from Love Potion Magickal Perfumerie. 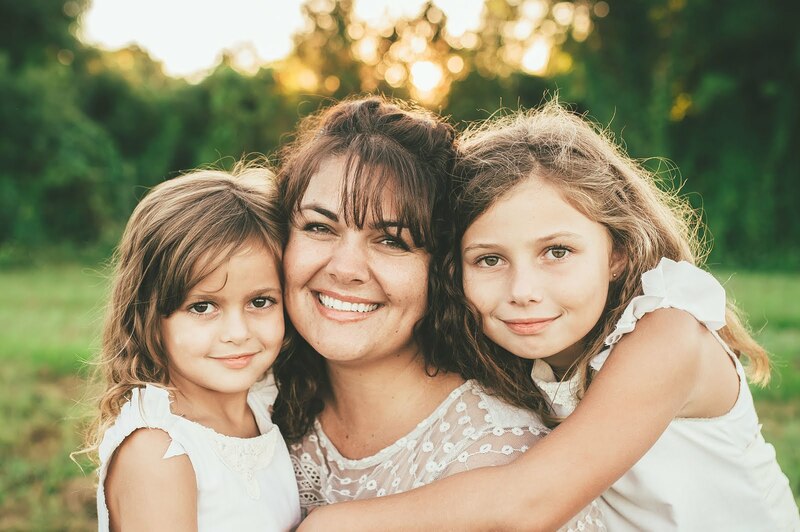 Mara possesses an incredible talent for blending scents and forming cohesive collections. Let's dive into her newest collection shall we? Seaside- Notes: Several varieties of suntan oil-type coconut, lotus blossom, green coconut, sandalwood and white sugar. Sugar sweet coconut oil with a watery green hue from the lotus blossom and green coconut cast limpid pools of aqua on the skin, like a secret tropical lagoon. The coconuts grow in depth and darkness as they meld into flesh, taking on the aged wood of sandalwood, golden amber, and vanilla orchids. A must for coconut lovers. Love Potion Summer 2016 Brule- Notes: The Original Love Potion blended with a luscious delicious dessert. Heavy cream and caramelized sugar with warm drops of cafe au lait and labdanum penetrating the gourmand lushness. I could drown in this fragrance. It begs to be worn on a breezy summer day perched on a delicate wrought iron chair at a Parisian cafe'. Delectable. Atlantic Shore- Notes: Lettuce leaf, bladderwrack, olive blossom, green coconut, vanilla and guavaberry. Bladderwrack seaweed and the white floral scent of olive blossoms tinge the air with a beautiful fresh breeze floating in from the coast. Gauzy with white musk and ever so subtly sweetened with the peachy nectar and lemony brightness of guava. It dries down into woodsy vetiver and bleached driftwood and more of the musk. Lovely. Betrothal Potion- Notes: None listed. Soft herbs and sweet florals crafted into a tincture for love. A touch of spearmint, feathery dill, green and peppery herbs overflowing a mason jar dotted with pink sweet peas and peony blooms. A beautiful delicate brew that pairs well with hooded side glances and secret half smiles. A melange of fruit flesh drips into the bottom notes for velvety sweetness. Butterfly Bloom- Notes: Five varieties of plumeria blossom, sandalwood and berry sugar. Mellifluous fans of plumeria petals unfurl from the towering frangipani tree that arches a bower over head. Blades of banana tree leaves snap in the breeze, sending verdant hues to my nose. The motley collection of yellow, white and pink plumerias offer a symphony of notes: coconuts still on the palm, green bananas, honeysuckle headiness. The sandalwood starts young and fresh then fades into creamy musk with just a whisper of that berry infused sugar to lend a general sweetness. Splendor in the Grass for Men- Notes: Green grass, woody vetiver, Irish moss, balsam, cedar, teak, African herbal essential oils, Oriental spice. Plump mounds of dewy moss and broken grass blades burst on the skin and under the nose. Balsam comes in with sweet evergreen harmony but does not linger long. Cedar and teak lend their signature aromatic tones with gathering strength. All the while, the grass rises underfoot and under nose and woody stemmed vetiver not far behind. Black Star Lavender- Notes: Lavender, black licorice root, star anise, amber, black tea, rain accord. Sweet and silky lavender goes noir. This blend brings to mind Deadly Sleeping Draught. Steely sugar dusted lavender buds crushed into silken ebony licorice. A drizzling of vanilla amber and a touch of smoky black tea push this fragrance into the decadent gourmand category, while the rain accord keeps it light and crystalline. I want to pour this all over my bubble bath warmed skin before I drift off to sweet dreams. I can also see this being a beautiful scent to wear daily just to calm the heart and soul. A full bottle of this will be bought. Mermaid's Kiss with Hedione- Notes: Sweet pea, water lily, plumeria blossoms, Bird of Paradise, bamboo, aloe, leafy wet greens, honeydew, cantaloupe, teak, sandalwood, white amber, hedione. Candied flower petals shimmer like pink rose bud lips. Cantaloups and honeydew highlight the tropical nature of sweet pea and plumeria, the enchanting aquatic breath of the mermaid's soft exhale passing through melon sugared lips. The kiss is deepened by sultry jasmine and teak, tapering into a sailor's dream on the trail of ethereal amber, airy musk and misty bamboo. Deliciously seductive melon based fruity floral that would wear perfectly in these late sultry days of summer. Ocean Mist- Notes: Ozone sea salt, vintage musk, lime essential oil, coconut, pineapple. Bracing sea spray misting the face, hair cracking like whips, the rhythmic crest and fall as the keel of the schooner cuts through the water. Lime zest cooling and metallic like the wet metal cleats on the ship that hold the lines. Must and musk rise from the damp wood. Faraway islands bristling with coconut palms and pineapple plants, send their regards on the currents of the wind, ever so faint and green. Pie in the Sky 2016- Notes: Four types of coconut cream, vanilla, buttercream, graham cracker crust spice accord. Lickable. Mouthwatering. Exquisitely delicious gourmand fragrance that is piled high with coconut custard topped with billowing clouds of vanilla whipped cream. A flaky crust of graham grounds the airy dessert without coming off as bakery and more as dark vanilla with a touch of cinnamon dust and amber. OCCO (Overt Cops for Covert Ops): Ambrosia 2016- Notes: Essence of Woman copulins, mango, cherry, ginger, vanilla bean, rich chocolate, patchouli. Chocolate covered cherry cordials. Mango brightening and creating more tartness to the cherry, giving it dimension. The saturated cherry glow fades into a dark chocolate love affair. Spiced ginger melds with the chocolate effortlessly and chocolate and patchouli? A match made in heaven. This was a surprise favorite for me. Normally cherry and chocolate are not my favorite scents to wear, but Mara has made a chocolate covered cherry that I love wearing. This one would be a joy to wear during the holidays. 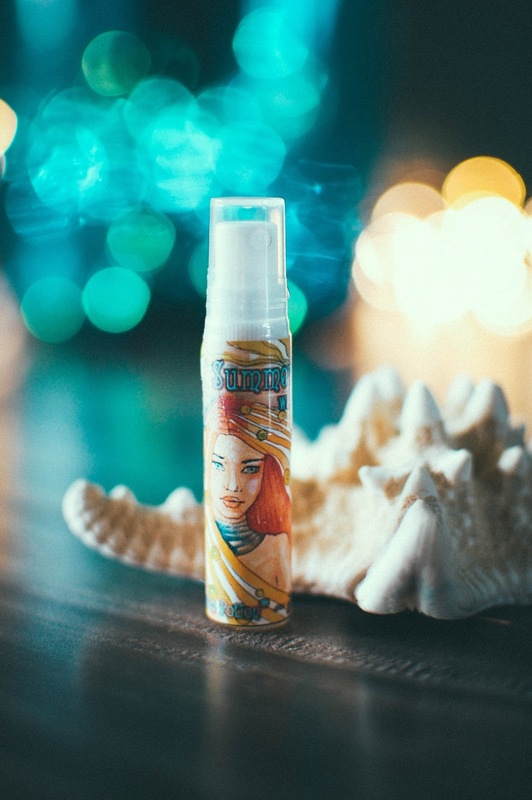 Summershine with Topper spray- Notes: Pineapple, aloe, orchid, white amber, Topper pheromone blend. That signature aroma of pineapple nectar, sticky on the lips and tart on the tongue blends with fuchsia orchid petals, thick and pliant with traces of plumeria hidden within. Aqueous aloe brings prisms of water droplets and coastal haze along to the mix. The whole blend is elevated by sandy and soft white amber lying underneath. I will be draining this sprayer quickly. Concentrated perfume oils (1/3 oz) are $24.95, one ounce sprays are $39.95 and 1.5 ml samples are $5.00. Very high quality scents at a generous price point. Summer is leaving us all too quickly, but anyone of these fabulous fragrances can allow it to linger on our skin for just a bit longer. 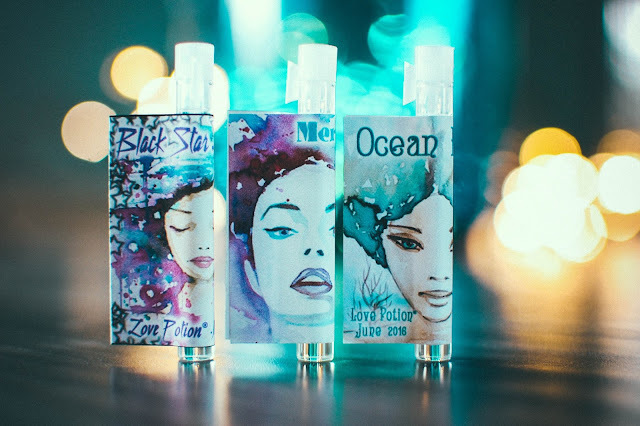 My top favorites in this collection include: Black Star Lavender (buying a full bottle of that! 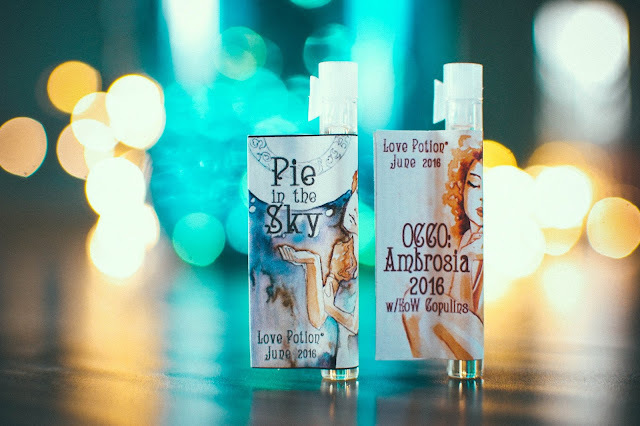 ), Love Potion Summer 2016, Betrothal Potion, Mermaid's Kiss, Pie in the Sky, Ambrosia 2016. Ocean Mist came in pretty high too. Love the lime in that one. Which of these would you like to wear?